Today we are celebrating the 2nd annual #BookDirect day. 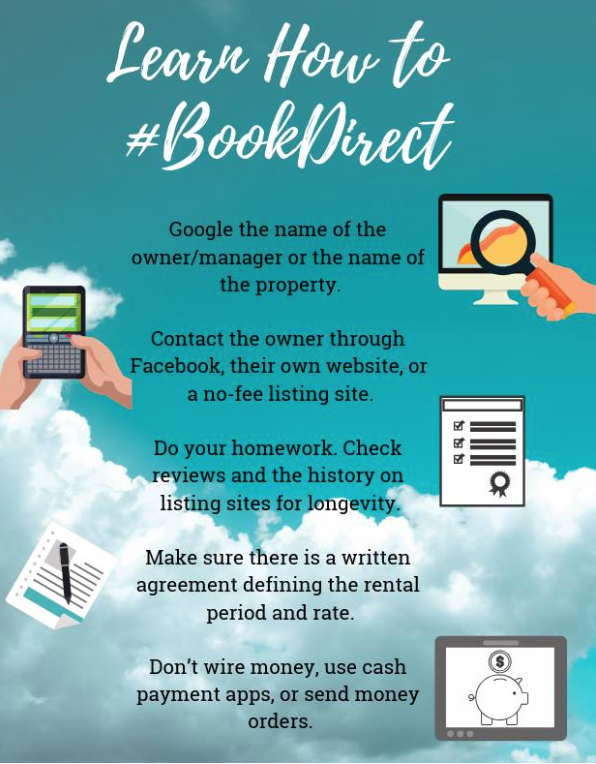 The #BookDirect initiative was first organized to educate guests about the advantages of bypassing third-party channels to book directly with management companies and homeowners. Not only are vacation rental owners facing the same issues regarding the often-high commissions set by listing sites, but also guests themselves frequently end up paying more for the same stay. For the past eight years I have used VRBO/HomeAway as my advertising venue for the rental of Dans Florida Condos (www.dansfloridacondos.com). I have two immaculate 2br and 1br units located on Anna Maria Island (Central Gulf Coast, in Bradenton Beach, FL). It's such a treat having direct beach access right across the street from our home away from home! A few years ago, VRBO/Homeaway was purchased by Expedia and immediately began changing their business profile. The first thing was to add a “Service Fee” of 7-13% to our rates all of which was passed on to you the renter. At the same time, we could see no benefit to you in return for paying that fee. We feel as that extra money could be used to purchase a margarita while resting your feet in one of the many beachside bars of Anna Maria Island, FL. VRBO/Homeaway began acting like any other rental Property Management Company and has continually harassed us to accept their “BIN” (Book It Now) feature, whereby they control the entire transaction, communication, etc. removing the “personal touch” of booking directly through an owner. Additionally, they removed the option to contact us directly (phone/personal email) in order to address any questions about the unit or the Island and accommodation. Thus VRBO/HomeAway is no longer an advertising or networking venue, rather a booking site which only priority is to drive the profits for shareholders. I am excited to participate in the #BookDirect movement by continuing to offer a “booking fee free” website at www.dansfloridacondos.com. Check out Dans Florida Condos to take advantage of a Booking fee free experience. You’ll also find additional information on Anna Maria Island, FL along with pictures, guest testimonials, and an updated Blog of events happening on Anna Maria Island and Dans Florida Condos. 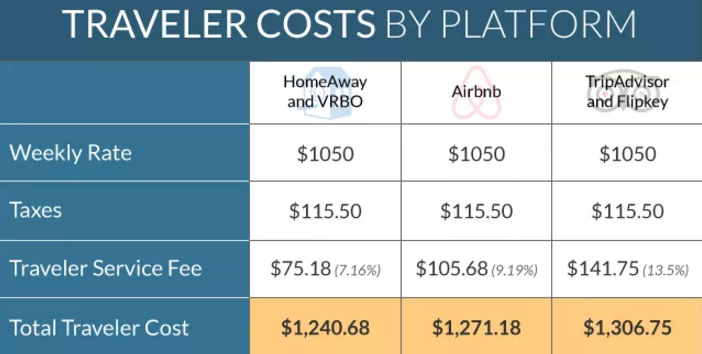 Did you know, that the average traveler spends $237 to big box booking sites like VRBO, HomeAway, and Airbnb!!! They could be using that on a golf cart rental, fishing trip, or several rounds of drinks! Try and #BookDirect with the owner or property manager. If you want to book one of our properties, please visit our website, call/text 773-598-9717, or email me at dan@dansfloridacondos.com. Search for your perfect vacation rental on any of the big box listing sites. Identify your top choices, noting the property’s name and location. Use your search engine (i.e. Google) to search for the property name and city and possibly the owner’s name to find their #BookDirect website. Check for traveler reviews on the major websites. If there are a decent number of good reviews for a listing (say 10+), and the listing has been posted for at least a few months and had confirmed bookings (this information is usually included on the site), chances are it’s a safe bet. If the owner were in the habit of doing things like unjustifiably canceling reservations or wrongfully withholding security deposits, the listing would have been pulled or you would see this mentioned in reviews. (It’s important to note that the big listing sites will not remove negative reviews at the request of the owner/manager unless they violate the company’s guidelines. If you have any questions about the changing Rental By Owner market or #BookDirect, you are welcome to reach out at any time. Please also take the time to “Like” our facebook page at www.facebook.com/dansfloridacondos. Check out this interesting roundtable by #BookDirect enthusiasts! *Please note - Dans Florida Condos posts blogs of local establishments and events periodically, for the intended benefit of our guests and visitors of Anna Maria Island. We do not receive advertisement commissions or other compensation from these posts. These recommendations are either experienced firsthand by us, or via reputable friends and partners on the Island. This ensures we are informing our guests of the "best of the best" that the Anna Maria Island and the surrounding areas have to offer. *The content of this blog is not to be copied, adapted or shared without the written consent of Dans Florida Condos.